Citation Information: J Clin Invest. 2005;115(12):3318-3325. https://doi.org/10.1172/JCI27071. Osteoporosis is a disorder in which loss of bone strength leads to fragility fractures. This review examines the fundamental pathogenetic mechanisms underlying this disorder, which include: (a) failure to achieve a skeleton of optimal strength during growth and development; (b) excessive bone resorption resulting in loss of bone mass and disruption of architecture; and (c) failure to replace lost bone due to defects in bone formation. Estrogen deficiency is known to play a critical role in the development of osteoporosis, while calcium and vitamin D deficiencies and secondary hyperparathyroidism also contribute. There are multiple mechanisms underlying the regulation of bone remodeling, and these involve not only the osteoblastic and osteoclastic cell lineages but also other marrow cells, in addition to the interaction of systemic hormones, local cytokines, growth factors, and transcription factors. Polymorphisms of a large number of genes have been associated with differences in bone mass and fragility. It is now possible to diagnose osteoporosis, assess fracture risk, and reduce that risk with antiresorptive or other available therapies. However, new and more effective approaches are likely to emerge from a better understanding of the regulators of bone cell function. The BMU with possible sites of estrogen action. Bone remodeling on the surface of trabecular bone is illustrated here. The process is similar in the haversian systems in cortical bone. Osteoclast activation is ordinarily initiated by an interaction of hematopoietic precursors with cells of the osteoblast lineage but may also be initiated by inflammatory cells, particularly T cells (see Figure 2 for further details). 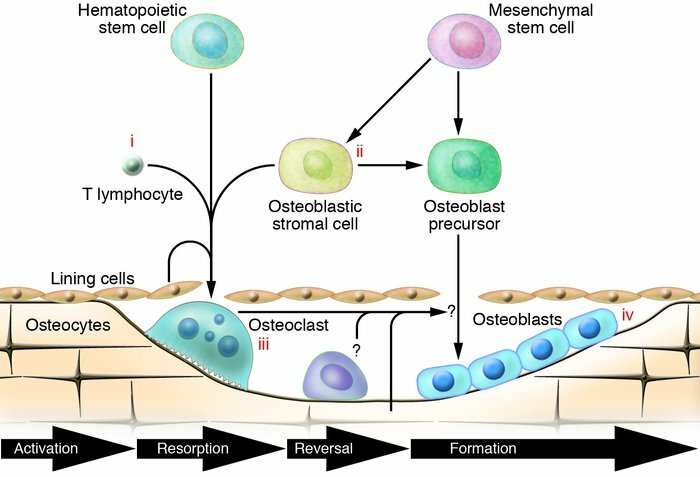 Once osteoclasts are formed, there is a resorption phase of limited duration and a brief reversal phase, during which the bone surface is covered by mononuclear cells but bone formation has not yet begun. The formation phase is then initiated, possibly by factors produced by the osteoclast or reversal cells or released from the bone matrix. The formation phase, which is substantially longer than the first 3 phases, involves the production of matrix by progressive waves of osteoblasts. These then become flat lining cells, are embedded in the bone as osteocytes, or undergo apoptosis. Potential sites of action of estrogen include effects on T cell cytokine production (i); effects on stromal or osteoblastic cells to alter their production of RANKL or OPG (ii); direct inhibition of differentiated osteoclasts (iii); and effects on bone formation mediated by osteoblasts or osteocytes to enhance the response to mechanical forces initiated by these cells (iv). Note that the BMU is shown as being compartmentalized by an overlying layer of cells. It has been proposed that these are separated lining cells, but they may be of vascular origin.